The Lamina sleeping bag from Mountain Hardwear is a great option for your camping or backpacking getaway. 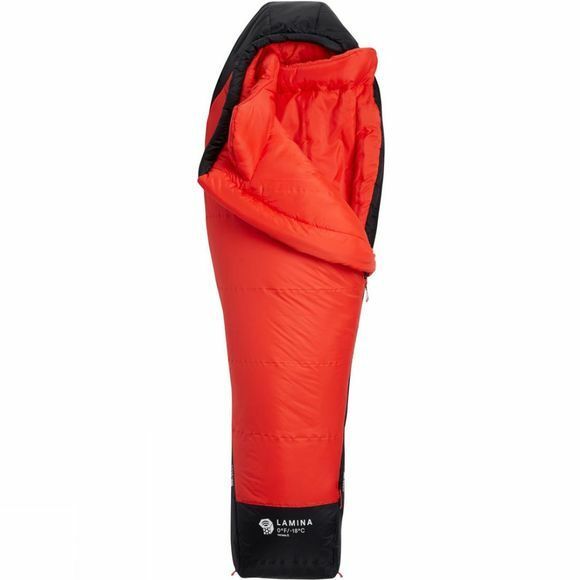 Featuring an ultra-packable, synthetic Thermal-Q insulation this sleeping bag provides great loft in critical areas to keep you warm while retaining a low-weight profile to ensure you don't notice it in your pack on the trek in between. The Lamina range focuses on creating a high warmth-to-weight ratio throughout their line in an affordable package. Insulation is zoned in key areas while additional features like the ergonomic draft collar, DWR treatment and the contoured foot box keep you warm and dry in the more challenging conditions. With a compression stuff-sack and a mesh storage sack included, this sleeping bag packs down to an extremely small size to ensure it doesn't take up too much space in your pack. This sleeping bag features womens-specific insulation mapping ensuring you remain warm and comfortable all night in a non-restrictive experience.